At SewForum.com you can discuss topics such as sewing, serging, embroidery, knitting and more, with over 55000 other Members, 160000 Topics, and 1.4 Million Posts. Show off your projects and enjoy tutorials made by members for members to use. Talk about anything from Sewing, Heirloom, Serging to Knitting, Crochet, Quilting and Crafting. Learn about upcoming events and share project ideas in local group chats with other members. Hello I have just received my new EP 500 embroidery machine I am very happy with the product really fast deliveries I recommend this company. I just wanted to shout out a big THANK YOU for this website! I have spent hours, and I do mean more like months:) browsing this website. There are sew many free downloads that my computer is probably gonna crash from all the designs! I also love love love seeing everyone else's finished products! I can't wait each day to see what new posts are up! Thanks again to everyone that contributes! "This forum is the greatest by far of any I have found online. Wonderful people here, valuable information, just super all round. Thanks for having this forum available for all of us stitchers." I, too want to thank all the moderators and everyone else involved at All Brands for keeping this forum going. The thing I like the best about this forum is how easy it is to read the "threads". Much better than any other site I've visited. Thanks again! One of these days I'll be brave enough to post one of my creations. This forum have provided a foundation for my embroidery experience. I have learned so many tips for embroidery and leads on just about every online purchase I have made. I would like to encourage everyone to participate in posting. That is what keeps this forum active and fresh. I lurked for a time, learning from everyone and I was so excited when someone posted a question to something I knew! Your projects, your knowledge, your tried and true methods may just be the thing someone else is wanting to know. Plus it is really fun to show and tell to people who are really interested and are not just trying to be polite. I especially appreciate the diverse age groups we have here. We all have our safety zone and it is nice to be able to look beyond that and stay fresh and current. So lets all take what we want and give what we have, Kim. 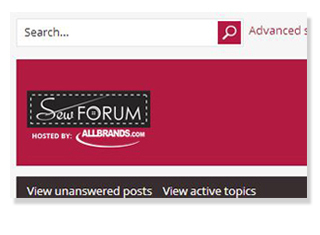 i also want to thank Allbrands for sponsoring the SewForum website. I only have lurked but have learned so much. It is a very valuable resource and I along with many others would be lost without it. Thank you very much- it is very appreciated. Sandy A.
I, too, am mostly a lurker and I LOVE IT HERE!!!! My granddaughters get many new outfits thanks to the inspiration and wisdom given on this site! Please everyone who posts - never stop - I love it!! I concur 100% with your statement. This is the BEST sewing forum and I have learned and been inspired by many of our wonderful members!! I agree there are a bunch of helpful, knowledgeable, friendly, and downright awesome people here!!!! I feel so lucky to have found this forum before I found any others. I too am here 4-5 times per day. Addiction to this site is my favorite vice! I want to thank all of those who have helped me either directly or by answering someone else's questions. You have instilled faith and confidence and helped put my fears to rest. I have learned to try anything because there is always someone who can help me with a fix. Thank you again for all you do and how much information and talent you are willing to share. Enjoy, Sharing, learning from all of the members, it is a continuous learning cycle. Love when new techniques and products are introduced. So enjoy seeing everyones accomplishments. Thank You All!! I agree 200%, this is the best forum ever...the ladies are so generous with their time and talent and so knowledgeable! I've learned SOOO much and a question never goes unanswered! Thank you ladies! Best place to hang out. Of course in between sewing, embroidering and quilting. I love Sewforum so very much! It's the best group ever, and thanks to you for all your hard work and efforts to keep it such! !